Brief follow-up to my 8/20 posting about Bosco chocolate syrup as an artistic medium — a posting that led to Don Bosco being my morning name a couple nights ago. 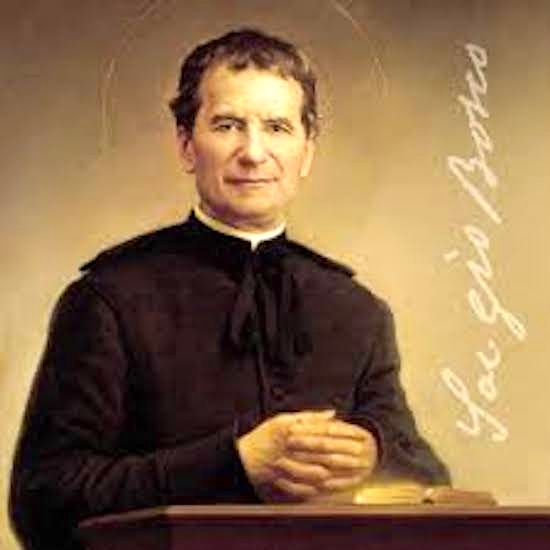 Saint John Bosco (Italian: Giovanni Melchiorre Bosco; 16 August 1815 – 31 January 1888), popularly known as Don Bosco, was an Italian Roman Catholic priest, educator and writer of the 19th century. While working in Turin, where the population suffered many of the effects of industrialization and urbanization, he dedicated his life to the betterment and education of street children, juvenile delinquents, and other disadvantaged youth. He developed teaching methods based on love rather than punishment, a method that became known as the Salesian Preventive System. … Following his beatification in 1929, he was canonized as a saint in the Roman Catholic Church by Pope Pius XI in 1934. Not surprisingly, Don Bosco has lent his name to quite a few Catholic educational institutions for boys and young men. For example, St. John Bosco High School, a Salesian college preparatory school in Bellflower CA (in Los Angeles County, southeast of LA). This entry was posted on August 25, 2017 at 3:39 pm and is filed under Language and religion, Morning names. You can follow any responses to this entry through the RSS 2.0 feed. You can leave a response, or trackback from your own site.